Given the growing importance of content marketing in the quest to attract sales leads and conversions – not to mention the significance of ‘social sharing’ and the contribution this makes to SEO – it’s not unreasonable to ask which marketing professionals will give you the best bang for your buck. By starting at the beginning and asking what are you expecting content marketing to achieve, you’ll have a clearer idea of who would be your best partner. To be effective, content marketing must have high quality, original content at its core… content that readers will find useful, practical and valuable enough to ‘share’ on social media sites. This is a complex brief – and certainly not a job for the amateur. To begin with, there must be a strategy that will target relevant content towards well-defined market segments. This includes identifying the most suitable media platform and devising an editorial programme that will engage with your target audience. The challenge is to identify which group of marketing professionals can provide the most effective service. That includes the skilful creation and placement of various types of ‘content’ – blog posts, articles, white papers, e-books, newsletters and so on. (It may also include non-written content such as infographics, videos, podcasts etc). The wide-ranging demands involved in creating such a diverse range of content place varying expectations on the skill-sets of suppliers. Take a look at the following options – then decide which is the most appropriate for your particular needs. IN-HOUSE – This is the first (and most obvious) option to consider – but do you have your own home-grown writing/design/production skills to call on? It’s also worth bearing in mind that content creation and dissemination is highly labour-intensive, with a voracious appetite for human resources! MARKETING AGENCIES – Those agencies with their own writers and designers can provide the range of skill-sets you needs as part of an integrated marketing package. This is never going to be a low-cost option, however. You may end up paying over the odds for the privilege of having access to their ‘full service’ offering. 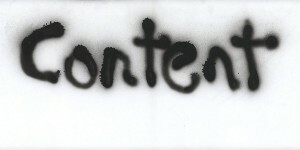 SEO COMPANIES – Content marketing will very likely be offered as part of an overall SEO package. A potential drawback with this option may be a lack of editorial quality. This is because, until recently, high quality copy (and the derived benefits of social sharing) was not essential to achieving SEO results. EXPERIENCED FREELANCE COPYWRITERS – For most clients, this should be the most logical ‘go-to’ option as a source of quality content. Freelance copywriters may not be geared up for the quick turn-round of high volume copy, but effective content marketing should be about quality – and not quantity. Even better, if you can source a copywriter (or small copywriting team) who can also implement a strategic content marketing programme, you have the basis of a successful long-term partnership.